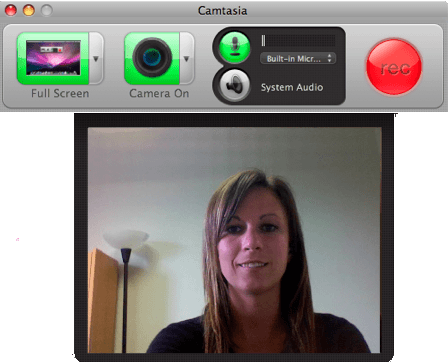 Camtasia records all activity on your screen within the selected recording area. Camtasia also captures any slide titles which can be used to create a table of contents. Open the presentation in Microsoft PowerPoint or Keynote. Open Camtasia or choose File > New Recording. By default, Camtasia records the entire screen of your main monitor. To select a different monitor, choose the desired monitor from the Screen menu. Click to enable camera video. From the Camera menu, select the camera device, such as the built-in iSight or a USB camera. A preview of the camera appears. Microphone audio is recorded by default. From the Audio menu, select the microphone. Click to enable system audio recording. System audio is the sound from your computer including mouse click sounds, audio from your speakers, etc. If the TechSmith Audio Capture Component is not installed, click the Need System Audio help button to install it. Click the Record button or press Command-Shift-2 to start recording. At the end of the presentation, click the Esc key to exit the presentation. Press Command-Shift-2 to pause and name the recording.